It comes around so fast I can barely keep up. The newsletter for August is up online. AND – I note – I missed putting up the July newsletter so I put that online tonight too. Bad Andrew! Our 15th Annual Scale Model Exhibition and Swap ‘n’ Sell is coming up fast! 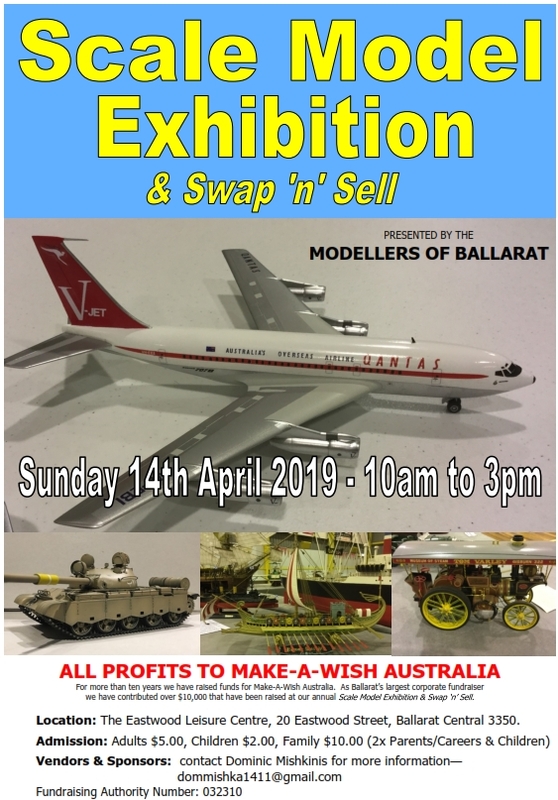 Each year the MoB raises funds for the Make-A-Wish Foundation by holding our annual Scale Model Exhibition & Swap ‘n’ Sell show. This year the show will be held on Sunday April 17 at the Caro Convention Centre, University Drive, Federation University, Mt Helen (Ballarat). We’ll be open 10 AM to 4 PM. There’ll be kit raffles, and a sausage sizzle too! All monies raised go to the Make-A-Wish foundation. The more kids you bring the cheaper the show becomes. Take the first Ballarat exit from the Western Highway into Ballarat. Keep driving along Victoria Street until you reach a set of traffic lights with a Hungry Jacks on the opposite corner. Turn left at this intersection. Follow the signs toward Sovereign Hill. At the Roundabout for Sovereign Hill continue straight on and follow the signs toward Buninyong and Geelong. You’ll pass the Midvale Shopping Centre before the Federation University signs direct you to University Drive. This road leads you onto the University’s Mount Helen Campus. It takes about 12 minutes from the Ballarat CBD. It’s the first Saturday in March, and you know what that means right? It’s MoB time once again. So tonight, at or about the hour of 7.30PM you ought to make your way over to the Koohinor Centre and join us for a little modelling, blustering, and the usual stuff that goes on in the MoB meetings. An important night tonight as we close in on the annual show. So get there if you can. Additionally the newsletter is now online. I’ve just put up some photos from the 2012 MoB show. You can find that page directly by clicking the link : Link to 2012 show photos. As always you can get there by choosing Image Galleries on the main menu, choosing Annual shows and then choosing the year. We are however missing many years. So if you have photos from a previous show would you let me know at the next club meeting. I can have a USB key ready for you take home and fill up with all those lovely electrons. I get a tingle just thinking about free electrons. Talk to you later on.